A video thumbnail is a preview sized image that represents a video on YouTube. Did you know that it is possible to customize your YouTube video thumbnails? Google offers businesses the option of selecting one of three still frames from their video after it is uploaded. However, you don’t need to pick from Google’s three preselected still frames. You can choose your own. In fact, it is beneficial to create your own custom thumbnail. Here are a few reasons why you should think about using custom thumbs if you are not already doing so. Video offers businesses a number of benefits. For one, it is much easier to explain complex topics visually, so many businesses use video on landing and product pages. A recent study revealed that the top 90% of B2B content marketers are focusing on providing informational needs before promotional messaging. If these updated inbound marketing tactics appeal to you, then you should consider adding video to your strategy. The video sharing website, YouTube, is used by over a billion people, and almost five billion videos are watched each day. This high level of video engagement is an opportunity for businesses to attract views from both paid and organic video views. 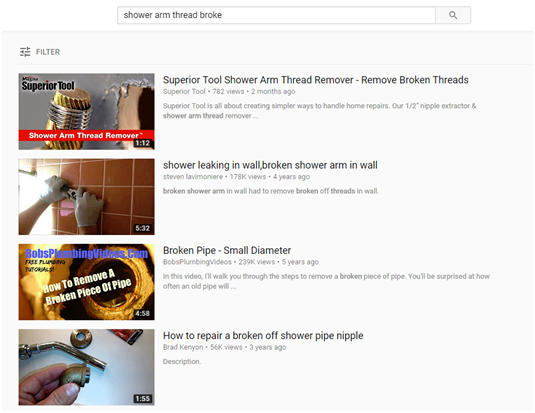 YouTube is a well-known, user-friendly, and effective place to explain how to use one of your tools, or provide information related to your services. A picture is worth a thousand words. When the search results on YouTube are presented, you want your video to attract more attention than the competition. Below is an example of what a well-designed thumbnail can do for your video. The first video result engages the viewer with a custom thumbnail that tells a story, highlights the brand, and looks professional. It is more eye-catching than the other results. According to Google, it is best to do competitor research to “see if your thumbnail stands out from images on similar videos.” It is also important to avoid “click-bait” video thumbnails which can detract from your brand. Click-bait refers to using unrelated or exaggerated images and text to get more users to click a video. Video ads on YouTube can also use custom thumbnails to help increase click-through-rates. This is a better option than using a generic still image. Custom thumbnails enable a business to maintain branding across its video content on YouTube. Users will be able to identify one of your videos based on the look of the thumbnail, logo placement and general design. Dynamics Online can help optimize your YouTube videos to increase rankings, develop custom thumbnails, and also advertise your videos to relevant audiences. Contact Ray Kirsch to learn more about custom thumbnails or available advertising features on YouTube.